Elevates the Mind and Opens the Heart! Rose Otto Essential Oil as an intoxicating aroma that eases stress! Used for skin care for thousands of years, it is perfect for dry or aging skin. Strong floral and sweet fragrance that is intoxicating and highly romantic. Rose oil or attar of rose is steam distilled from the flower of the plant. Rose Absolute is extracted through a solvent method and can contain chemical constituents, therefore it is not considered therapeutic grade. It is of lesser quality and therefore used primarily by the perfume industry. The process in which rose otto essential oil is obtained is a two part process, and is very costly compared to obtaining the absolute. One drop of pure rose essential oil = 60 roses! Fifteen mls of pure rose essential oil = 65 pounds of rose petals! 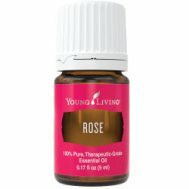 One ounce of pure rose essential oil = 60,000 roses! Two pound (and about 3 ozs) of PURE rose oil = therapeutic quality = up to $5000 per pound or more! So as you can see producing pure rose otto essential oil is extremely expensive! To compensate, companies will use a less expensive extraction process (absolute) or will adulterate the oil. Rose oil is commonly adulterated with Geranium essential oil or Palmarosa essential oil because they have a similar aroma. Seeing things in terms of dollars and cents always makes things a bit clearer. And as I have said many times if you want results, you need therapeutic oil! And that does come with a cost associated with it. If your rose oil is less than $175 for 5 ml than you should be seriously questioning whether your oil is pure! Rose oil has been used by the perfume industry for years. The question is-is it really rose? Because rose can be applied NEAT (undiluted) it is excellent for supporting healthy skin including dry skin. You will see it in many skin care products. It will also help to restore moisture balance and is very nourishing. Rose otto essential oil is included in many professionally made blends because of its diversity. From releasing stress to moisturizing skin, rose is a welcome oil. My favorite blends that contain rose are Forgiveness Joy, Gentle Baby and White Angelica essential oil blends. I use all of them in my daily life as well as at the barn. Want to Purchase Therapeutic Rose Otto Essential Oil? Buy Rose Otto Essential Oil Here! Why is this information important? There are several species of rose that are grown in different parts of the world including Bulgaria, Turkey and Morocco. The Moroccan species (Rosa cenfifolia) is very high in phenyl ethanol while the Bulgarian species contain a high level of citronellol. They both have different aromas and properties so make sure you know your genus species, extraction process and your supplier! Where is the name derived from? Rose (rosa) comes from a Greek word “rodan” meaning “red”. Did you know that rose was contained in many of Cleopatra’s cosmetics? What are the Plant Properties? Well being and heart opening. What are the Documented Uses and Benefits of Rose Otto Essential Oil? Supports healthy skin; nourishing dry skin. What is the Aromatic Affect on the Mind? Its sweet and floral aroma makes it uplifting and stimulating to the mind. What is the Spiritual Influence? This oil has been used for emotional balance for hundreds of years. It is primarily used to open the heart chakra so one can experience unconditional love through relationships. This includes relationships with our selves, our partner, our work and the divine. Using rose even in small amounts can help us release fears associated with intimacy, trust and possessiveness. It will also integrate our male and female energies which are key to becoming “whole” and balanced. What Chakra is Affected? The heart and crown chakras expand. What is the corresponding Chakra Color? Red and pink. Can this oil be used for Animals? Absolutely, dogs and horses love this oil! But I have to tell you with the high price tag, I tend to use professionally made blends with rose as an ingredient. Most of the blends I use are for emotional release or well being, so rose as an ingredient creates a synergistic effect or a better result anyway! My favorite blends that contain Rose that I use with animals frequently are Trauma Life, Joy and SARA essential oils. Use Trauma Life for shocking experiences, calming and emergencies. Note about Animal Use: Certain oils can be very toxic to cats. Pine and citrus products and oils in particular. Please consult your vet if you are not sure about applying any essential oil to your pet. What are the Safety Precautions? First, only use therapeutic grade essential oils! Rose has no known contraindications. It is Generally Regarded as Safe (GRAS). Did you know that the rose was called “the queen of flowers” by the Ancient Greek poet Saphho? Did you know that the color of rose was said to come from the blood of Adonis? Adonis was a Semitic God (later Greek) and was the god of vegetation! Go to the Oil Shop! Buy Rose Oil Here! Place rose otto essential oil over your heart to keep your heart open to romance and new adventures!